The best gelato in Rome. For real. I’ve written about the best gelato in Rome before. 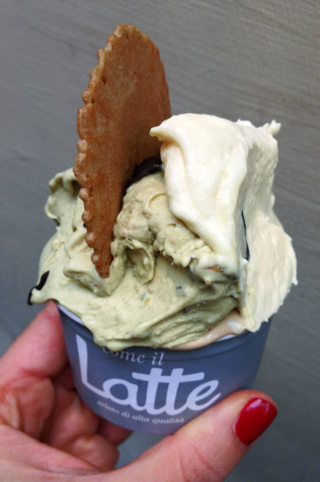 Last summer, I did a roundup of six of my favorite gelato shops in Rome. And three years ago, I “outed” my very favorite gelateria, I Caruso. But you know what? Things change. (Even in Rome!). And for 2014, it’s time for an update. For one thing, I Caruso is no longer a hidden gem. (I’ll take some of the blame for that). And on a recent visit, I found its gelato, while still good—and way better than the fake junk you’d get at most of Rome’s other gelaterias—not quite as flavorful as I remembered. Meanwhile? Just up the street and around the corner, another gelateria, opened two years ago by a former I Caruso employee, blows I Caruso out of the water. At least if you prefer your gelato rich and decadent. Like I do. (Hey, go big or go home, right?). 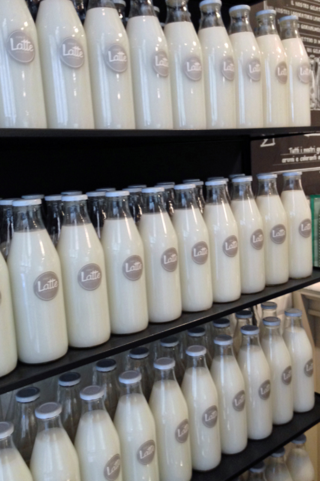 I now present you with… Come il Latte. Too many flavors to choose from. Just means a few more visits will be necessary. I had high expectations for Come il Latte, since none other than gelato god renowned gelato master Claudio Torcé recommended it to me. With one bite, I knew: Expectations exceeded. As you might guess from the gelateria’s name (“Like Milk”), their gelato comes creamy. Really creamy. That’s because fresh cream makes up 40 to 70 percent of each gelato. 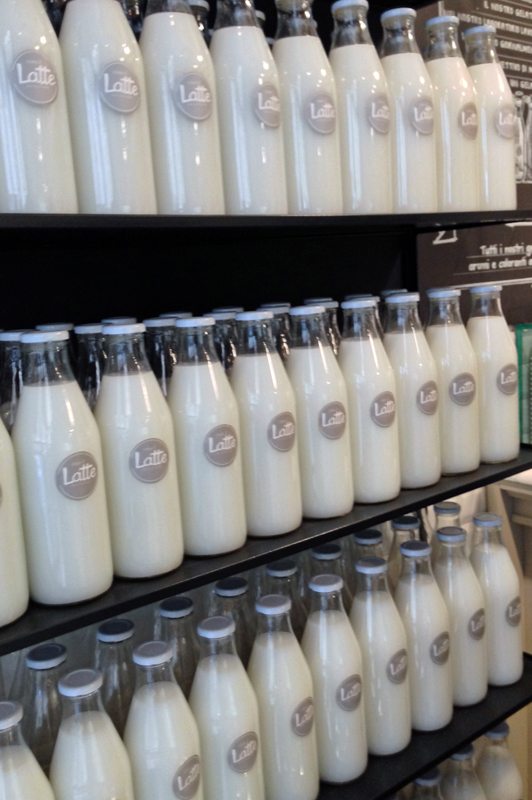 Not so into dairy? No problem. Eight flavors come sans any milk whatsoever. I tried the no-milk chestnut flavor, and it blew me away. But it’s not all creamy textures and dairy-laden recipes. Rare for a Rome gelateria, Come il Latte strikes a balance between a smooth, soft gelato and throwing in chunks of “stuff.” At most other high-quality gelaterias, pistachio, for example, comes blended to a silky texture. Here, it’s also creamy… but with small, chewy bits of pistachio stirred in. None of which would make a difference, of course, if the ingredients weren’t so high-quality. But from Sicilian pistachios to Ceylon cinnamon, they’re top-notch, fresh, and in season. 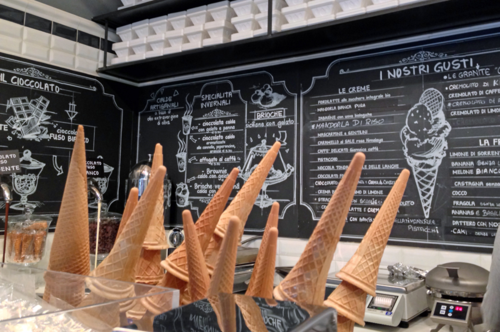 Plus, as should be par for the course for any self-named “traditional” or “artisanal” gelateria (but often isn’t), the gelato comes sans hydrogenated fats, preservatives, colorings, or artificial antioxidants. But then we’ve got to talk about the flavors. Because Come il Latte boasts all the classics (pistacchio, lemon, coffee), plus creative, seasonal flavors (the caramel with pink Hamalayan salt might be my new addiction; they’ve also got mascarpone with Gentilini biscotti, pineapple and basil, and ricotta with Sambuco and almonds). Once you’ve navigated your way through the list of flavors, you’re offered the option of adding extra-dark (64 percent) chocolate or white chocolate, swirled on from one of the chocolate fountains at the end of the counter. And homemade whipped cream, with flavor choices including zabaione (which adds Marsala wine) or zuppa inglese (the Italian custard-based dessert). In a nice touch, it’s all included with the cost of your cup or cone. Now do you see why this is my new favorite gelateria in Rome? Thought so. You’re so not going to regret walking in here. Although your waistline might. 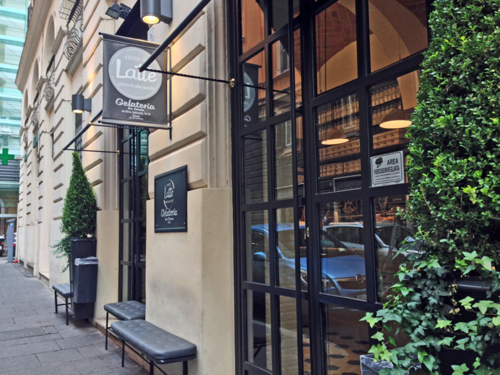 Come il Latte is located at Via Silvio Spaventa 24/26, a 5-minute walk from Piazza Repubblica (and just around the corner from I Caruso… the perfect opportunity for a taste test!). Thanks for the update! 🙂 I’ll have to swing by before I leave Rome next weekend! Your blog has been too wonderful for finding things in the city while I have been here for a semester studying, you do a wonderful job! Thank you! Mh this is new to me I knew Neve di Latte close to the Foro Italico and Stadio Olimpico. You should try also Otaleg and Tony in Viale dei colli Portuensi, or one of the Grom gelaterias. Personally this summer I discovered one very nice and newly open called Juicy Rome in Viale Europa. They are a bit out of the centre but you know for sure that are not fake touristic ones! 😉 Cheers! Come Il Latte was a revelation. I too drool over the salted caramel flavour thing but the best ever were the free flowing chocolate taps. 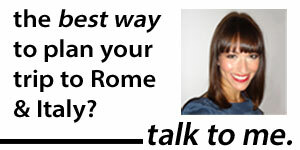 Pingback: What is the Weather in Rome Really Like?